One of the bigger “huh?” moments from this year’s Comic-Con was the complete lack of anything from 20th Century Fox’s The Fantastic Four. Granted, director Josh Trank‘s superhero adaptation was in the midst of production and barreling towards a fast-approaching June 19, 2015 release date, but fans were hoping to see at least a title treatment or image from the pic. Alas, no such preview emerged, but Invisible Girl herself Kate Mara has now shared a kind of Fantastic Four image by way of a celebratory selfie with her fellow FF members. “That’s a wrap on Fantastic Four” the tweet reads, though it’s unclear if that means the entire production has wrapped, the principal castmembers have wrapped, or only Mara has wrapped. Regardless, since we’ve seen nothing official from the film thus far, it’s kind of neat to see Mara, Miles Teller (Mr. 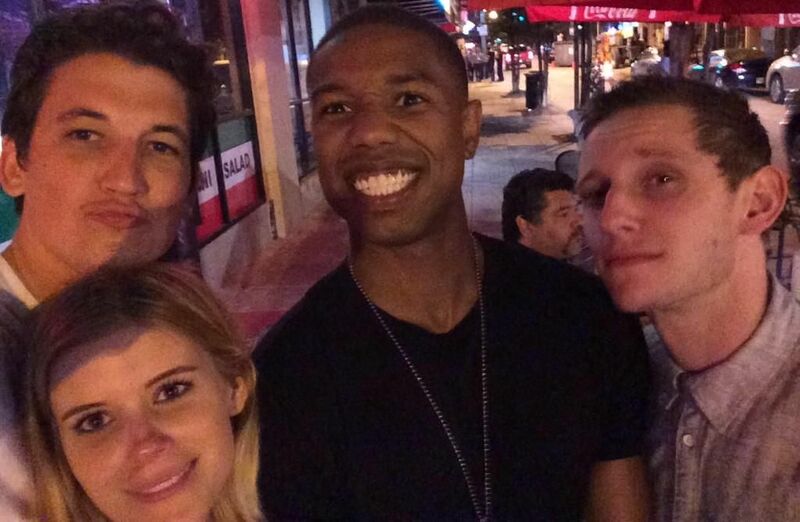 Fantastic), Michael B. Jordan (Human Torch), and Jamie Bell (Thing) all together on the streets of New Orleans. Hit the jump to check out the image for yourself. Hopefully a genuine piece of Fantastic Four material will show up in the coming months. The film also stars Toby Kebbell, Tim Blake Nelson, and Reg E. Cathey.